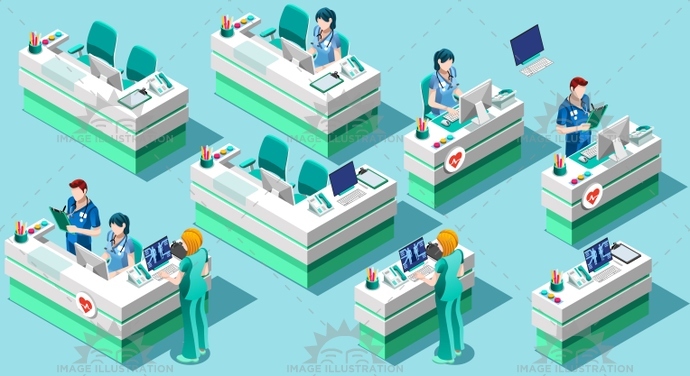 Stock product - detailed vector illustration - Bundle Medical Collection - Nurse Station Vector Isometric People - created by Aurielaki. Image formats EPS AI JPG. Vector isometric nurse station medical equipment bundle. Includes hospital reception of waiting room. SKU: Nurse-Station-Vector-Isometric-People-Medical-Bundle-AurielAki. Categories: Exclusive contents, Hospital Illustration, Isometric People. Tags: 3d, black, blue, bundle, care, clinic, clinical, code, color, creative, design, doctor, female, flat, group, health, healthcare, Hospital, illustration, image, infographic, isolated, isometric, male, man, medic, medical, nurse, nursing, people, person, physician, professional, scrub, senior, silhouette, staff, standing, station, stethoscope, surgeon, surgery, team, turquoise, uniform, vector, waiting, white, woman.